The tricky thing about choosing the “right” time management tools is that the right tool for me may be the wrong tool for you. And the tool for one task may be inappropriate for another. So I’ll give you some options. Test them out and keep looking for others. High-tech and highly-structured solutions are best for capture. Low-tech and loosely-structured solutions are best for planning. It can be tempting to write your brain-dump list on a legal pad. The problem is that looking at it all at once is overwhelming. A page or a page and a half of things to do can lead to analysis paralysis. When you’re doing your brain dump, task management or note-taking software is appropriate. You can sort that list by priority, then take just the top priority items and move them to a paper to-do list. Keep the paper list visible. Close down the software list so it doesn’t distract you. Some people use their calendar as a to-do list. If this method works for you, use it. I find that I work more efficiently if I use my calendar for items that require me to be in a specific place at a specific time. Most of my tasks may need to be done over several days, and they often have flexibility about where can be done. So I keep my task list separate from my calendar app. If you’re a Microsoft Office user, Outlook may be the only task management software you need. Excel spreadsheets can be used for calendaring, to-do lists and project management, but that’s a whole other post. Michael Hyatt recommends Nozbe. It’s got Mac and Windows versions, as well as iOS and Android. Nozbe’s base app is free, but you need to buy a subscription to sync data across multiple devices. Hyatt writes about Nozbe here. OmniFocus gets great reviews, but it’s only for Mac and iOS and is also pricey, although at least it’s a one-time price and not a monthly subscription, like Nozbe. Remember the Milk is a popular Web-based app with mobile options for iOS, Android, and Blackberry. It’s free for basic service, with a $20 per year pro version that adds features. Evernote rocks in every way, and is available for about every platform. It’s meant more for note-taking than task management, but I use it for both. You can add to-do checkboxes to your lists if you want them, and you can add an alert to any note. It’s free for basic service and has two upgrade levels. This is my choice. I also use an iPad to-do list app called Errands. It’s far simpler than any of the full-on task management apps. If you search for to-do list apps in the app store of your mobile platform of choice, you’ll find a ton of options. Read reviews and pay attention to the features that are most important to you. One key feature I look for is the ability to repeat a task from its completion date. That is, if I want to do a task every five weeks, but I forget a week, I want to tick it off as done and have it repeat five weeks from the time I completed it, not five weeks from when it was originally due. Errands is extremely flexible in its ability to set all kinds of repeat criteria, which is one thing Evernote lacks. Apps are good for scheduling things in the future, because then they’ll beep to remind you of stuff you might otherwise forget. Apps are not so good for things you need to do by the end of the day. Hence the low-tech solution. To keep track of things that need to be done every day, my colleague Diana Matthews uses 3-by-5 cards and an envelope. Each card has a task on it. In the morning, she takes the cards out of the envelope. When a task is done, its card goes into the envelope. By the end of the day, all the cards are put away, ready for the next morning. I have not yet experimented with adapting this to different tasks to be done on different days, but it strikes me as a good way for kinesthetic learners to manage their to-do lists. 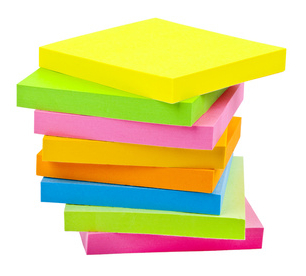 Mark McGuinness says if your to-do list doesn’t fit on a 3-by-3-inch Post-It note, it won’t fit in your day. I’ve experimented with 3-by-5 cards and with a 5-by-5-inch notepad I picked up at a trade show. When I use this notepad, or the 3-by-5 card vertically (giving myself 5 inches of vertical space) I put too much on my list, and things have to carry over to the next day. But the 3-by-3 Post-It works every time. This entry was posted in Writing and tagged Software, Time Management.